The tasks for today were to check if PCR worked successfully and then clean up our DNA if so. This did not happen for everyone. 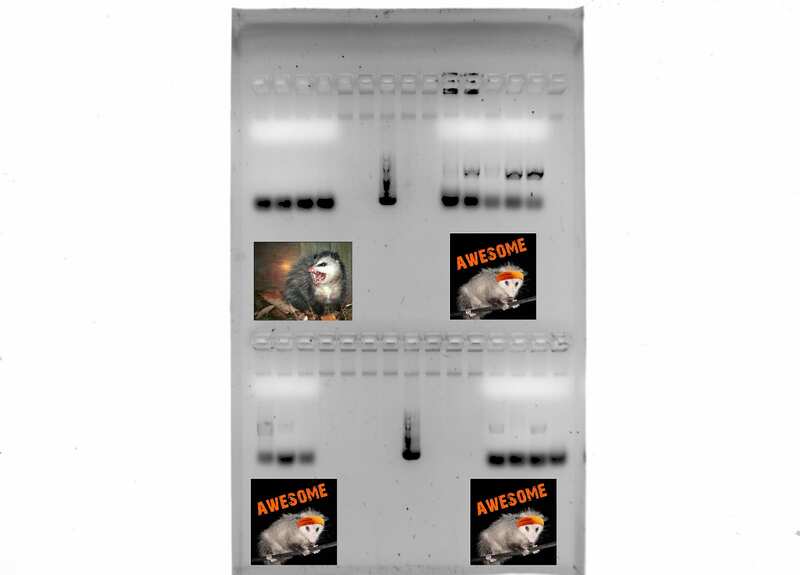 We ran our PCR samples on a gel to check if the expected products were there, similar to last week. However, this week we expected to see one band instead of a smear since we amplified one specific sequence. – On a piece of parafilm, mix 2µl of loading dye with 3µl of each PCR sample separately. For me, this meant four 5µl dots of loading dye and DNA solution. – Load each 5µl dot into it’s own well, remembering it’s location so you can identify the sample later. – Place the lid on the box, making sure the red and black plugs are lined up correctly. Run the gel at 120V for about 15 minutes. 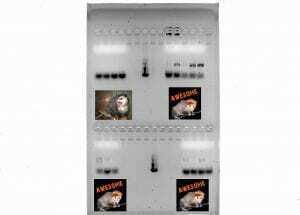 Awesome Possums Gel Image of PCR Samples. Mine were the 4 in the top left corner. I saw no success (and went from an awesome possum to an awful possum) , however my benchmates had varying degrees if success, which made me feel a little better because that means I didn’t totally mess up the master mix last week. About half of the class had no success, so we redid some of the steps from last week to prep our samples for another round of PCR. Since everyone seemed to have decent genomic DNA based off of last weeks gels, we all used our same gDNA samples and followed the same steps as last week. Note: I added less master mix to my yellowtail sample (AJC-Y) because I thought we had run out. Kayla had smartly aliquoted the Master Mix into different tubes so people could work at the same time, but I didn’t know this so I thought I had the only tube and did not quite have 18µl for my last sample (probably around 15µl instead). When I learned there was actually some master mix left, I decided it was maybe best to not try to estimate how much to add. Place PCR tubes into thermocycler and start EXOSAP program, which keeps tubes at a constant warm temperature for 45 min. When program finished, load PCR tubes into labeled rack and place in freezer.